PMS Construction Management Corp. (“PMS”) was retained as construction manager by the Department of Design and Construction (“DDC”) to provide all the services necessary to design and build the Fire Department of the City of New York (“FDNY”) new firehouse Engine Company #75, located 2175 Walton Avenue in the Bronx. PMS retained the Dattner Architects (“Dattner”) to furnish the required Architectural pre-design and design services for the Project. 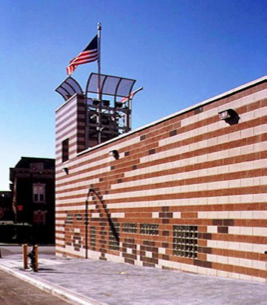 The three-company fire station incorporates the latest FDNY standards and utilizes cost effective materials throughout. The exterior bands of colored concrete block and artwork (representing a ladder truck) boldly announce this first-responder facility. The large apparatus room floor and prominent “fire tower” are used for fire rescue training and drill activities. 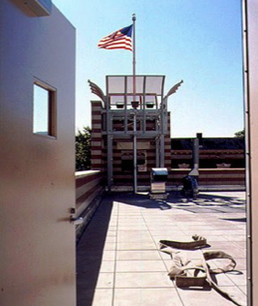 PMS and Dattner’s commitment to designing and constructing a facility that had the least impact on both the environment and community was realized in Engine Company #75. Two of the prime focuses of the design of the building and its systems were energy efficiency and sustainability. With those goals in mind the building was constructed utilizing the most current FDNY standards and includes energy efficient, cost effective materials throughout. 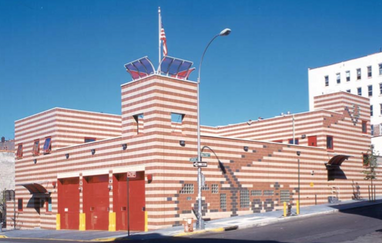 In addition, PMS and Dattner achieved, through the building design, an indoor environmental quality that was both acceptable to the FDNY and cost efficient. The building layout was also maximized to achieve the most cost effective design. As a result, the apparatus floor was located on grade while the elevated portions of the building were set into the grade of the sloped site. The facility also includes two parking lots located on the side and to the rear of the building for staff parking and additional FDNY apparatus parking if necessary. This approach fully utilized the existing site conditions while minimizing excess cost by reducing the amount of excavation that was required. PMS provided all Construction Management /Design/Build services for EC #75. The four Prime trade contracts were procured by PMS as per Wick’s Law requirements. PMS also retained the services of the controlled inspection consultant to accommodate project related needs. The design contract, controlled inspection contract, change orders and administrative services resulted in a total cost of $5,630,000. Through close coordination of the DDC, FDNY and PMS this Project was completed on budget and on time. PMS, being the sole point of responsibility, was able to achieve a timely and successful completion of the Project in eleven and a half months from ground breaking to final completion.